DataFilterDescriptorItem: The default item that uses filter value editor according to the data type of the field. DataFilterComboDescriptorItem: Uses a RadDropDownList for setting the filter value and allows the user to choose from a predefined set of values. 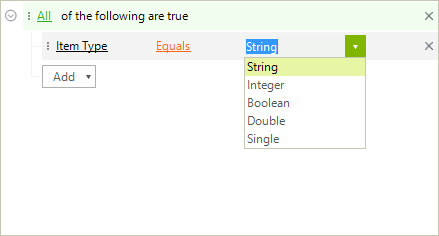 This section shows the common descriptor items properties. DefaultValue This value will be used as filter value when a new descriptor is added. FilterOperators Gives you access to the list of the available filter operators. 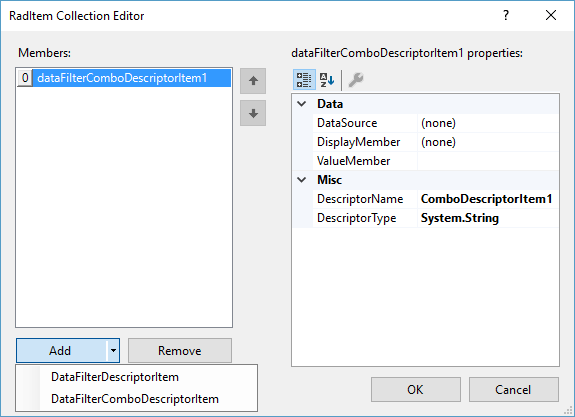 DefaultFilterOperator Set the filter operator of a newly added descriptor. DescriptorType Indicates the data type used for this descriptor. The DefaultFilterOperator property accepts only valid operators for the specified type of the descriptor item. If an invalid operator is set, an exception will be thrown. RadDataFilter also exposes the PropertyDisplayNameNeeded event which allows a user-friendly name to be specified instead of the default names which are extracted from the fields. DataSoure: The source for the items displayed in the RadDropDownList. DisplayMemeber: The field whose values should be displayed in the RadDropDownList. ValueMember: The field whose values should be used for the filter expression. The RadItem Collection Editor that allows you to edit the items at design time can be shown either via the Smart Tag or by the Descriptors property in the Properties section in Visual Studio. It allows you add/remove/modify the items. Figure 2: DataFilterComboDescriptorItem at runtime.